One taste of spring's debut fruit, and we're ready to get in the kitchen. How about you? Sneak one from the carton, take a bite, and imagine them topping pillow-soft Cornmeal Shortcakes, tossed in a delicate salad paired with cheese and fresh basil, or dipped in a salty-sweet caramel mixture. That’s what our Test Kitchen Professionals did last April while strawberries were at their prime―sweet, luscious, and juicy. Our commitment to testing in season makes it a sure thing you’ll get the same flavor-perfect results this year. Associate Food Editor Mary Allen Perry raved about the blend of flavors and the prettiness of the sliced berries in our Strawberry-Turkey-Brie Panini. “It’s a fresh, warm-weather spin on a Monte Cristo sandwich,” she said. Find it: We use a Krups FDE3 Panini Maker in our Test Kitchen. A ripe berry will have a shiny, deep red color from the tip of the berry to beneath the green cap. It will be sweeter and juicier than those with white or green beneath the cap. Check the carton from top to bottom for any damaged or moldy fruit. They’ll cause the others to deteriorate quickly. Sort when you get home. Remove and discard any bruised berries you didn’t see when purchasing. Don’t wash. Return berries to the carton or place in a colander, uncovered. You want air to circulate around the fruit. Flavor starts to fade after two days of refrigeration. Before you slice, cut in half, puree, or chop strawberries for a recipe you should “hull.” This term means removing the leaves and tiny core beneath the cap of the berry. A paring knife will do it, but be careful not to remove too much fruit. To use a tweezer-like strawberry huller (available at kitchen shops), pinch the berry right beneath the cap and twist. 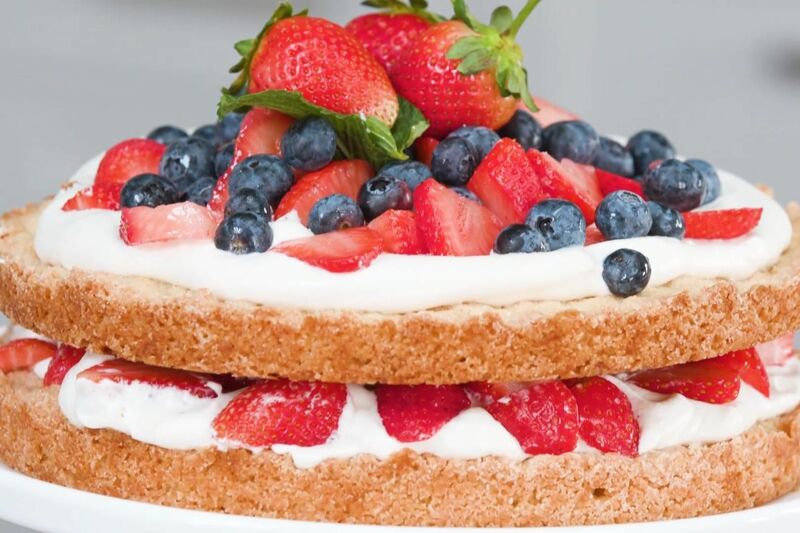 Not only is this a gorgeous dessert, but the combination of salt from the crushed pretzels and sweetness from the strawberries makes this recipe irresistible. 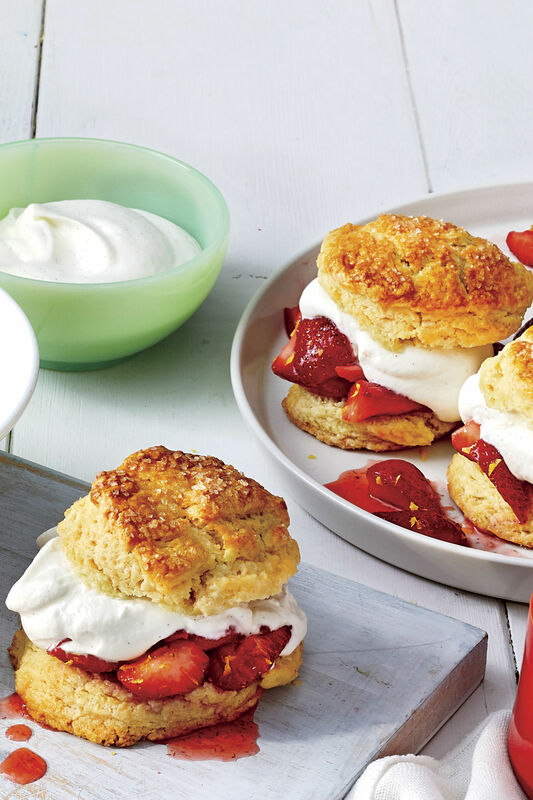 We loved these fresh from the oven and topped with Strawberry Curd. This easy salad full of fresh strawberries, crisp lettuce, and toasted pecans is the epitome of spring. Securing parchment paper with masking tape (it won’t melt at the low temp) makes it easy to spread picture-perfect layers of meringue. Blend buttermilk with your choice of fresh or frozen strawberries to create this creamy springtime treat. This simple recipe only takes 15 minutes to prep before going into the ice cream maker. Crisp rhubarb has a tart flavor that teams up perfectly with sweet strawberries. Serve over fresh arugula or as an appetizer with toasted French bread baguette slices. Garnish with fresh basil. Here the cream cheese is added after beating the butter and sugar, and the cake bakes at a slightly higher temperature than usual. 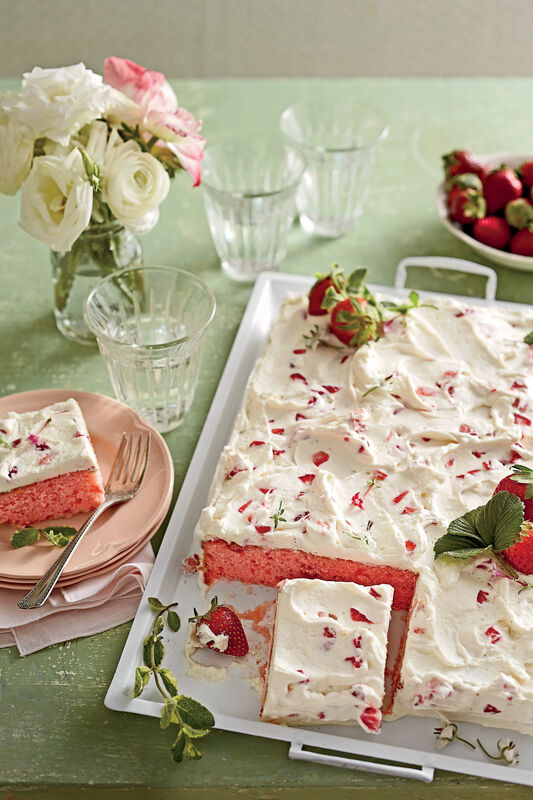 Layers of moist strawberry cake and Strawberry Buttercream Frosting make this three-layer cake a must for strawberry lovers. Club soda, fresh whole strawberries, and frozen daiquiri mix set these margarita spritzers apart. Serve on sultry summer days and enjoy the fizzy sweetness of these colorful cocktails. 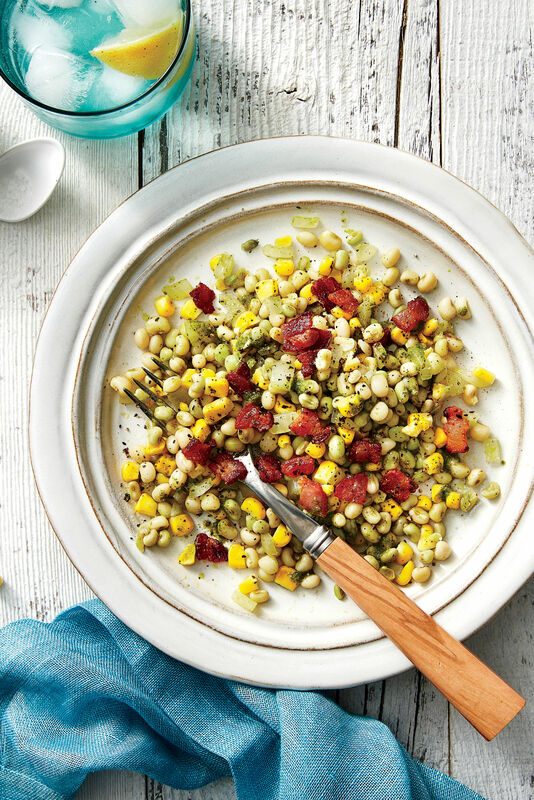 Cool off with this sweet, refreshing soup on a hot summer day. A confetti of bright, sunny flavors, Strawberry Salsa adds an over-the-top finish to grilled pork, beef, chicken, or even fried catfish. A crisp chocolate cookie-crumb crust teams up with fresh strawberries and frozen yogurt for the ultimate make-ahead dessert. The sturdy pretzel holds the weight of the strawberries and cream cheese, making this bite-sized crostini an ideal finger food. Pretty in pink, this mousse cake recipe is perfect for a shower, family get-together or party. Wow your guests with this refreshing spring salad. The Sweet Basil Vinaigrette gives it the perfect finishing touch. For a light and quick poolside drink, Cava Sangria is the way to go. Refreshing and fruity, this 5-ingredient sangria has the perfect combination of flavors from the strawberries and mint leaves. After the first sip, you’ll feel like you’re on vacation. 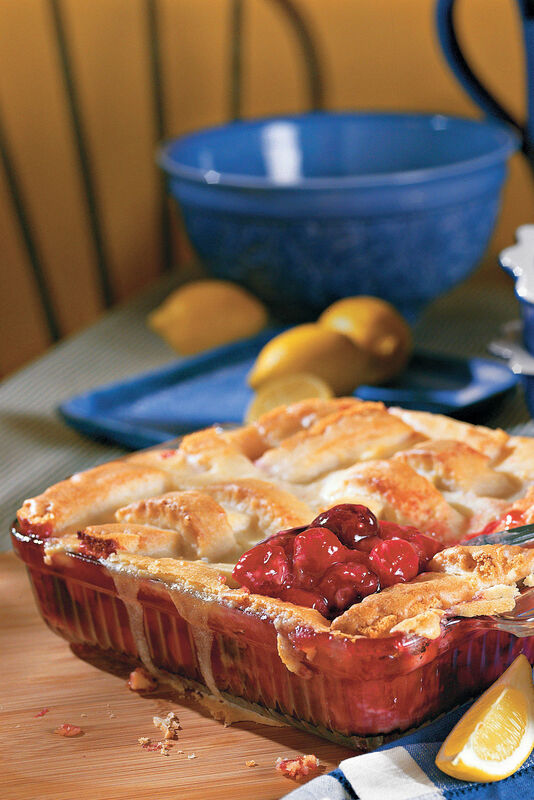 Serve this easy recipe at your next ladies' luncheon or shower. The bite-size pieces are perfect for appetizers.